Tammy Duckworth is a congresswoman from Illinois’s 8th Congressional District. As a Black Hawk helicopter pilot, she was one of the first women to fly combat missions in Iraq until November 12th, 2004 when her helicopter was hit by an RPG. 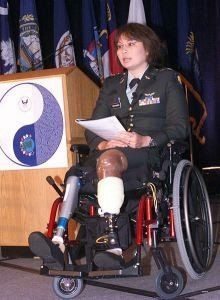 Tammy lost both legs and part of the use of her right arm in the explosion, and was awarded the Purple Heart for her combat injuries. Thornton Law Firm would like to thank our veterans today on Veteran’s Day, remembering their sacrifice, hardships, and time away from loved ones. No other words can express it as well – Thank you.